Hello. I'm James Crown, Centre Manager of Mathnasium of Radlett, your neighbourhood maths-only learning centre. We help children in Years 1-11 (Ages 6 to 16) understand maths by teaching it in a way that makes sense to them. We know how to teach your child maths. Our specially trained maths instructors will teach your child how to understand maths in an individual setting – our unique approach enables us to effectively explain maths concepts well and lend a helping hand to every student. Our tutors foster a caring, encouraging environment that helps students thrive and learn! We pinpoint your child’s learning needs, meet them where they are and take them where they need to go. 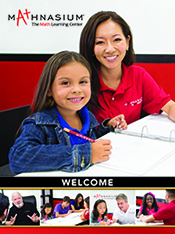 At Mathnasium we use our unique assessment process to determine (with great accuracy) exactly what each child knows and what they need to learn. Next, we design a customised learning plan to teach the concepts the student needs to master. It doesn’t stop there – our encouraging instructors continually check progress along the way to make sure students truly understand and retain the concepts we’ve taught. The results are transformative – students will see measurable changes in attitude, confidence, and school progress. Our instructors will also set aside time to provide homework help. We help children understand the homework assignment so they feel better prepared to complete the work at home – underscoring their understanding of concepts and transforming homework frustration into a welcome challenge. This centre is now open and accepting students, call 01923 388 641 to find out more and book your free assessment. Very happy with MATHNASIUM. Well organised and my son is very happy. Mathnasium has been a complete game changer for us. We were concerned that our son would struggle to pass his KS2 SATS. Mathnasium worked wonders for him. Not only did he pass but he is now in the top set for maths at secondary school and Maths has gone from being his worst subject to one of his favourites. Thank you to the wonderful staff at Mathnasium for your incredible work and support. Would recommend to anyone! This is our second year with you guys and my daughter improved so much, she’s among top of her class. Everyone is very impressed with her results. My daughter loves maths so much and I must say that Mathnasium is the place that she loves the most! Keep up the good job guys! Thank you! Mathnasium has been absolutely fantastic for my children. They eagerly anticipate every visit and are growing in confidence. The staff ensure each session is fun but importantly, full of learning and consolidating their skils. The children also love their rewards charts and maths games - my daughter has always struggled considerably with maths but Mathnasium has managed to help her see that she can achieve in maths if she just applies herself and works hard. Thank you for all your help! I would definitely recommend friends and family to Mathnasium, everyone is so friendly and professional and we are already seeing an improvement in our daughters maths. Mathnasium has improved our daughter's Maths skills and the style of tutoring offered has helped her enourmously. Very professional runnirganisation. The staff were always friendly and very kind and attentive to the students. On going assessment was very informative. Overall I would thoroughly recommend. A fantastic , encouraging way of learning for children . Would highly recommend it to friends. My daughter won’t stop asking when she’ll be going to Mathnasium next. She is subconsciously using her maths skills in her everyday activities which is a new skill. I think that explains enough how good they are in their job. Thank you for helping Ame become more confident with her maths. We are so proud at how she has preogressed. I like the professionalism of the staff and teachers and the ability to adapt to different learning requirements of pupils. My son enjoys coming to your classes and His maths has improved. My daughter throughly enjoys every session. My son has become more confident in maths thanks to the caring atmosphere and one to one tuition he has received from the staff at Mathnasium. Adam started at Mathnasium in January this year and the improvement in his Maths has been incredible. What I have found more surprising is that his confidence in all areas of his learning has improved. I couldn’t recommend Mathnasium highly enough. Would definitely recommend it! Everyone is lovely there and it is a fantastic teaching environment especially for children who are afraid of maths! A friendly, supportive team in a calm environment. I am very happy with my daughters progress. Excellent tutors my son is making steady progress with his maths and his confidence is growing. The staff have been amazing. Mathsnasium has made maths a subject that Scarlett enjoys rather than hates! Thank you all! We had a good experience with focus on the childs weak spots. Allowing them to have a good overall strength in all areas of their maths level. Great atmosphere, fantastic knowledgeable staff, my daughter gained skills and confidence. Mathnasium's Longest Serving Instructor Says Goodbye!